Sleep should be a simple process, but due to our lifestyles, problems and worries, our natural sleep process can easily be disrupted, to make matters worse, because we try to hard to get the sleep we need we further disrupt our falling to sleep cycle and process. It is estimated that over 60 million Americans suffer from insomnia? 20% of Americans reported that they did not wake up feeling refreshed on any of the past seven days. Overall health was reportedly highly associated with sleep quality. Sixty-seven percent of those with less than good sleep quality also report “poor” or “only fair” health, with 27 percent reporting otherwise “good” health. Low life satisfaction, or unhealthy lifestyles, can affect your quality of sleep and poor quality sleep can affect the quality of your life. Many people have trouble dropping off to sleep, whilst others wake up at times during the night feeling alert and wide awake. It is estimated that 1 in 3 adults don’t get enough sleep. Some people have periods when they have little to no sleep. I remember when we had our son, who rarely or hardly ever slept for the first two to three years, if he did drop off, he would wake every two hours. We had to take it turns doing shifts to sleep, just to try and grab a few hours here and there, and I know the devastating effect a lack of sleep can have on you. Not only do you feel exhausted, you tend to pick up every cold and virus going. If you have to work, and look after children, plus fit in all your other household chores, then a lack of sleep will eventually take a toll on your general health and well-being. But it is not just about lack of sleep, because it is also suggested that, even those who are getting enough sleep in quantity aren’t getting the quality they need. This can depend on the person, their age, their circumstances, their lifestyle and even their diet to a certain degree. Young children and babies tend to need more sleep, it has been suggested by the National Sleep foundation, that adults on average, need around 7 to 9 hours sleep a night. Although it is important to get enough good quality sleep, if you set targets that you must get 8 hours a night, and you don't manage to achieve your eight hours, then this can lead to over obsessing about how much sleep you've had. We all feel a lot better after a good night's sleep, however, it is important that you don't worry and fret too much about getting the exact amount of sleep, that is recommended. Everybodies sleep requirements can vary, if you feel refreshed and alert, and you don't feel tired during your day, then that probably suggest that you're getting enough sleep. Learning to relax, and feel happy, can help to reduce how many hours sleep you require. One of the, worst things that will keep you wide awake, is trying to hard to get to sleep, in fact, you should not try or even think about trying to get to sleep or not sleeping at all, just chill out an let it happen. You cannot force or make yourself go to sleep, if you try you will interfere with your natural falling to sleep process. Your body will let you know if you're getting enough sleep, if you become too obsessed about trying to force yourself to get, a certain amount of sleep, it can actually have the opposite effect, and keep you awake. Sleep needs to happen naturally, so you if you're not getting enough sleep, then you need to quieten your mind, relax your body and just allow it to happen naturally, without you trying or thinking about it. Relaxing before you go to bed, and calming your racing mind are the ingredients to a good quality night's sleep. The key is to set a peaceful and tranquil setting, because a relaxed ambience is essential to set yourself up for a peaceful night's quality sleep. Sometimes if you worry about the amount of sleep you're getting or you should be getting, can cause people to check the time every few minutes or count how many hours they have before they have to get up. We all though the health benefits of getting enough sleep, but if you're constantly checking the time, to see how many hours you have got left, then this can seriously disrupt your chances of falling to sleep. We have all done it and fallen into that trap, where you're either clock watching and worrying about how much sleep you're not getting or you wake up and check the time and calculate how many hours you have got left. The best thing you can do is to turn your clocks around so you cannot see them and just switch off and daydream. If you have got this sleep disruption habit, then you need to break and change it, otherwise it will make you even more stressed about not getting the right amount of sleep. Remember the trick is to relax and not to think about sleep. If you are stressed or you worry a lot, then this can deplete you of your energy and nutrients. When you are worried or feeling stressed, then you are in the fight or flight survival, physical state of heightened alertness, this is the exact opposite state to what you need to be in to have a good night's peaceful sleep. Ironically, people who worry a lot, due to their racing mind, tend to struggle to get to sleep, and even when they do manage to drop off, they end up having a restless night's sleep. People think that they have to do something to stop their worrying thoughts, but that actually makes things worse. All you have to do is, leave your worrying mind alone, embrace the feelings, and just observe your mind, but stay relaxed around your thoughts, and when you do, your mind will calm down all by itself. Another thing you can do, is when you're lying in bed and you find yourself worrying, write your worries down on a piece of paper and tell yourself, that you will deal with your situation in the morning. You can also use your imagination to create a virtual state of security, when people worry they're only focusing on the worse case scenario, but you can you know, imagine a better and more positive outcome. Quality of sleep is probably more important than quantity, when you're feeling relaxed, before you fall asleep. Not only will you have a restful and good quality restorative sleep, you will wake up feeling refreshed and alert, your mind and body will be calm and at peace, and you won't have a care in the world. This will leave you better able to cope with and handle the challenges and pressures of the day ahead. Whereas, the person who suffers with a lack of sleep, will start the day off on the wrong foot, they will tend to feel more irritable, they will be drained of energy and they will tend to be tired throughout the day. When you go to bed with a restless mind, you will carry all your emotional baggage with you through into the next day, and the whole process and cycle of negativity will start all over again. Therefore, it is equally as important, to relax and calm your mind and body, leading up to the time you go to sleep, than it is to get enough sleep. Preparation, is the key for a good night's sleep and to have a good day to follow. If that is not a good reason, to get some much needed quality sleep, I don't know what is. Did you know lack of quality sleep has been linked to? Magnesium has been stated as the natural stress and anxiety reducers. "Magnesium is the most important mineral there is" Charles de Carle. "It is difficult to measure and hard to study, but magnesium deficiency accounts for untold suffering, and it simple to correct"
It has been described as the stress, anti-dote and the most powerful mineral, and if you're struggling with mood swings, stress and anxiety, then this could indicate a sign of a magnesium deficiency. Magnesium can be found in all your tissues, mainly bone, muscles and your brain, it helps with many things, including helping helping you to make energy and helping your muscles relax, which in turn will help you to relax and sleep better as well as providing you with more energy during your waking hours. Turn off the electronics at least 2 hours before bedtime. One of the reason people struggle to sleep or they experience restlessness and poor quality sleep is because instead of relaxing and quietening their mind and body, they do the opposite and do and have things that stimulate themselves. Watching late night action packed or horror programs and films, last thing at night can disrupt your quality of sleep by stimulating your brain frequencies. Your brain tends to carry on with the last thing that you do before you go to bed, your natural sleep process should involve winding down before you go to bed. You should also refrain from having caffeine, alcohol or nicotine, leading up to your bedtime, as these are all stimulates. So it is important to turn off your phones, computers and TV, before you go to bed, then spend some time relaxing or meditation. It is OK to listen to relaxing music or sounds that are designed to calm your mind and body. Create a dark and cool space. Black out curtains are great for long summer days, especially if you work night shifts, they will also help to prevent you waking up too early, in those long summer days, when there is an early sunrise. Our sleep process and pattern have evolved to react to darkness and light, we tend to become more alert and awake on the onset of light and we wind down for sleep as it begins to get dark. Try to avoid having lights or devices that have small lights in your bedroom, try to keep your bedroom temperature cool, (but not to cold). If you have difficulty in falling asleep, you may benefit from starting to dim down your lightening an hour before your normal bedtime. It is also important to make yourself feel as relaxed and comfortable as you, again relaxation is associated with sleep. Have you ever noticed those times when you feel so relaxed and chilled, that you just drop off to sleep, during your day. Sleeping on our stomachs can create pressure on the natural curves of your back, as well as putting excessive strain and tension on the neck. Therefore, it is better to lay on your side or your back. If you sleep on your back, make sure you don't use a pillow that is too high or too low, find the right height so the line of your spine is supported. It can also help to place a pillow under one of your knees, to prevent hypertension of the back. If you sleep on your side, use a pillow that naturally fills the gap in between your shoulder and your head, without allowing your head to drop or raise up to high, ideally you want to keep a good alignment of your spine and head. It can also help to place a pillow between your ankles and knees. Many people have less sleep during the week, and they try to catch up with their sleep on weekends, by having a long lie in. Often, they will stop up even later at the weekend, and have a long sleep in. However, when you keep changing your sleeping patterns, it can seriously disrupt your sleep patterns and throw your body clock all over the place. Although you're restricted during the week due to work, college or family commitments, it is important that you try to adhere to a regular sleep pattern and routine as much as possible. Here is the good news, the Mindplace Kasina can help you and your followers get more quality sleep, by helping to create a calm atmosphere and natural sleep inducing process. A good regular sleep routine is the best way to maintain a healthy sleep cycle so you can enjoy the main positive health and well-being benefits. 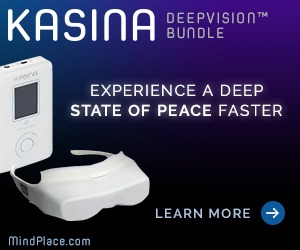 The Kasina comes stock with a 60 minute Sleep audio and visual stimulation track, and it works by relaxing your mind and body, by help to mimic your natural sleep rhythm cycle and process. Stimulation enhances low frequency and decreasing high frequency brain waves. The results are less arousal or wake ups, they can also help to reduce your stress levels. Meditation Headspace, has a great sleep mediation and is free for the first 30 days.